The meeting began with a salute to past Commodores. Commodore Champion related that we want to have a presentation each month of the year of some aspect of our sport. This month’s presentation was by Lee Huddleston who gave a talk on trailering safety, complete with most of the Harbor Freight trailer section for visual aids. Thanks Lee ! We need people to present these each month so please come forward and share your nautical skills with the club. Contact Deborah if you can present something. Thanks to Bill Champion for the excellent Fajita meal. Purser’s Report – Purser Alan Cannon gave his financial report. The bills have been paid and we are starting to see some income from renewals, $10,000 so far. We still have people in arrears and some people are seriously in arrears for multiple years. We need to begin the process of moving old unpaid for boats out of the yard or get them sold for fees. Purser Cannon has now moved the savings account into an interest paying money market fund. We have a 3rd pavement payment coming up for $1800 and a balance of $3700 left to pay. We are saving money for our core dues which can be as much as $6500. If you are in arrears please pay up now! 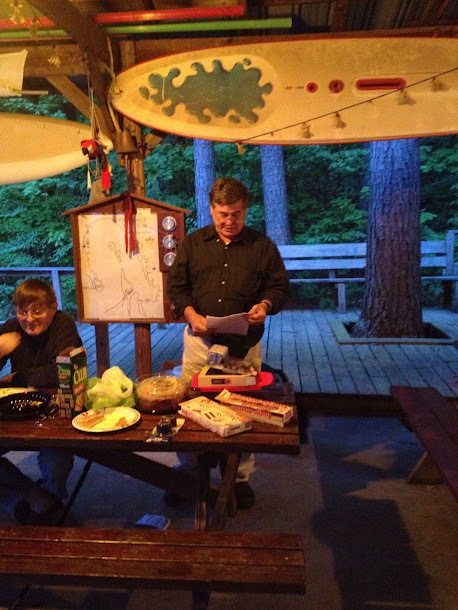 Race Committee Report – Racing Chair Doug Roberts reports we have a full roster of free and other races this year. Please plan on attending and volunteer to help with the committee boat. We are discussing issuing citations instead of flags and maybe presenting flags at the Christmas party. Herb Siewert remarked that he has the medallions for the Yankee Doodle. We also discussed giving out trophies for the year. Yard Master Report – We got a good start on the ramp, the yard and the Sunfish during the last work party. The next work party will be April 28th and focus on graveling the path and planting flowers etc. Commodore Champion also wants to reset the pavers in plank park to mitigate weeds growing up in them. Also planned is to redeck the first 12 feet of Committee boat deck with Trex. We will start promptly at 9am and lunch will be served. Max has graciously offered to cook. Other Business – Sailing School is starting 10 a.m. to noon on April 21, 28, May 5, and 12th. Need boats to take people sailing, we have 3 teaching and need enough boats to take 4 people. We lost the camera’s at the club, due to thieves and also apparently someone took the AED from the shed. We plan to change the combination on the locks immediately, if you need the new combination contact the Commodore at 270 781-2522 (home phone) or 270 991-2661 (cell phone). We will have a discussion of this at length to be held 45 minutes before the May meeting. Herb remarked that Jeff Wheeler and family is leaving the area to move to Atlanta, this will be a loss to the club and we wish them well. They will also be wanting to sell 2 of their 3 boats. More details later as they become clear. This year its pretty much raining boats on the club, if you need to purchase one, this would be a good time. Tim Hayes, Bill Grapes, Lee Huddleston’s brothers, boat, the Wheelers and others all have boats for sale. The meeting adjourned at abut 8:30 pm.